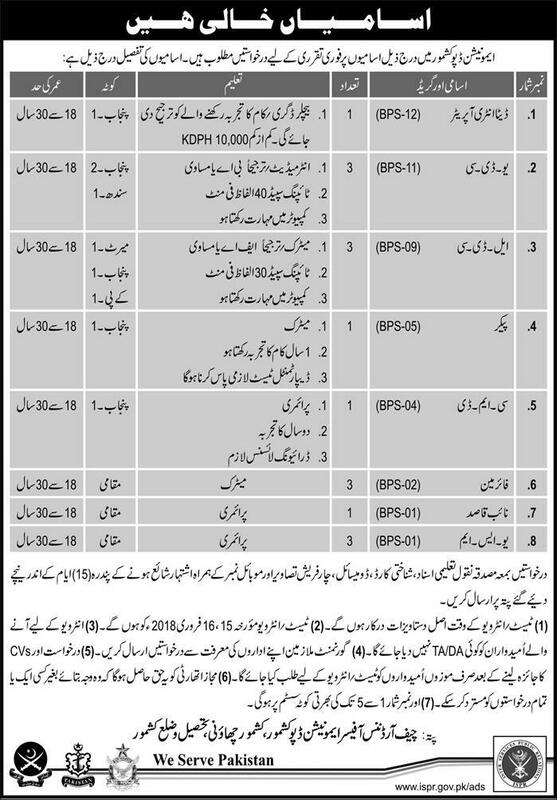 Situations Vacant in Ammunition Depot Kashmor 28-01-2018 Express Newspaper. New Government Jobs 2018 for those who are waiting to do job in Kashmor. Job titles are as follows, Data Entry Operator (BPS-12) 01 post, UDC (BPS-11) 03 Posts, LDC (BPS-09) 03 Posts, Packer (BPS-05) 01 Posts, CMD (BPS-04) 01 Post, Fireman (BPS-02) 03 Posts, Naib Qasid (BPS-01) 01 Post, UMS (BPS-01) 03 Posts. Candidates can send their applications to Chief Ordinance Officer Ammunition Depot kashmor, Kashmor Chaowni, Tehsil & District Kashmor.